We were mentioned today in the Washington Post Express Night Out. Unfortunately, they didn’t mention the great products we sent for review! We sent Muraccio Extra Virgin Olive Oil from Lazio, as well as Olio Santo extra virgin olive oil from Villa Cappelli in Puglia, and the Canonica Verde Umbrian Spice Blend, from a producer based in Umbria. For the article, we suggested the Muraccio combined with the Umbrian Spice Blend, and also featured the Villa Cappelli Olio Santo, as a beautiful example of an infused oil, ready for dipping. At least you now know. And, let us know if you agree with the first sentence of the article! (Hint: We think you can). We’re in the midst of the holiday rush, filling our own shopping baskets as we help our customers fill theirs! What have I selected for gifts? Castello del Trebbio, Principe di Gerace Bergamot, and Spice Blends from Canonica Verde (Todi Roasting Blend, Umbrian Spice Blend). My next purchase will include Tommaso Masciantonio’s Trappeto di Caprifico DOP— but I really need to find the right person who will appreciate “the stunning” Zafferano. 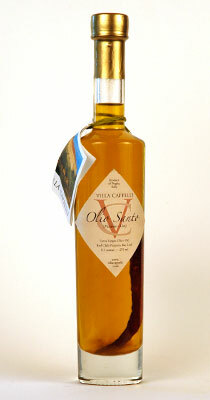 Tasca Regaleali is another great favorite olive oil to gift.